Unspecified by the text. I have set the time at mid morning. The sun is on the left of the scene, producing light tones on the left of objects, & shadows on the right. You can see cast shadows of the trees, rocks & people. The Wise Builder, dressed in blue outer robe, standing on the rocks. The Foolish Builder, dressed in green, digging in the sand. 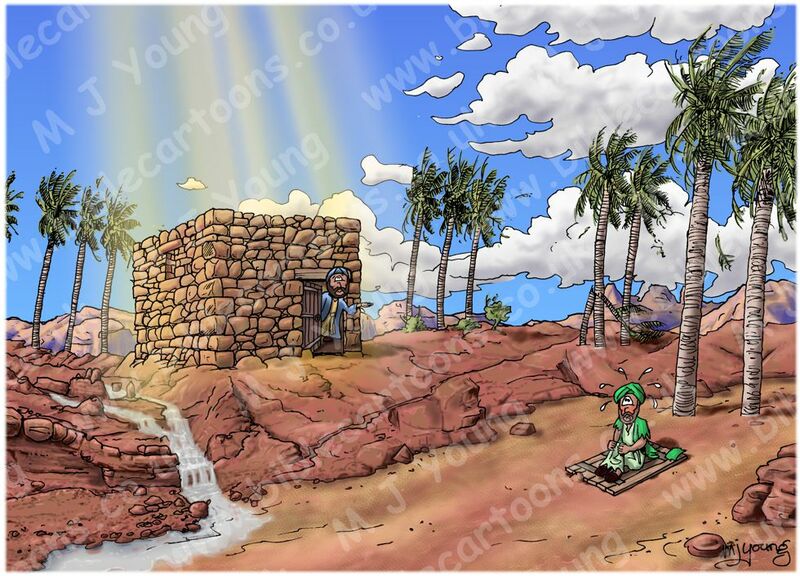 This is the sixth scene in this series of 6 that tells the parable (story) of the Wise & Foolish Builders. There is nothing left of the Foolish Builders home in this the final scene, except his front door, which the Foolish Builder is sitting on, like a life raft. He is looking rather tearful… not surprising really! I have added a heavenly glow over the Wise Builder & his house built on the rock. Sort of likle Godly approval I think! Remember, this is a metaphor which Jesus told his listeners. It isn’t really about building houses, rain & storms, etc, but rather about hearing Jesus’ words & putting them into practice. Jesus seems to be saying that troubles & adverse conditions will come upon us in this life, sooner or later. I think we can all agree that this is so. These adverse conditions are not likely to be actual rain storms & weather, thought that can happen too! More likely they might be redundancy, health issues, a lose of some sort, a death in the family, or some other circumstance that really challenge us & what we have put our faith in. It is at these times of trial & difficulty that we discover just what (or who) we have actually put our faith in. The wise man or woman is the person who hears the words of Jesus’ & acts upon them. The foolish person is the one who hears the words alright, but does not put them into practice. When the trials & difficult times come (& sooner or later they will come) the foolish person will discover that they do not have the amazing resources of Jesus teaching to fall back on & support them during their trial. Jesus teachings are brilliant – the whole Bible is full of God. And He wants us all to access his words & live our lives accordingly. That will not remove all the difficult times from our lives, but it will give us a resource to remain standing, even in the most trying of challenges, rather than folding up under the pressure of the trial & crumbling into nothing, like the Foolish Builders house did. If we put our trust in Jesus & his words, then we are like the man who built on the rock. Jesus teachings are not just nice words, but vital to life. The Bible, God & Jesus are all referred to as the Rock, in the Bible itself. The word “Rock” is used as a symbol of God in the Old Testament (see 1Sa 2:2; 2Sa 22:3; Isa 17:10; Ps 28:1; Ps 31:2, 3; Ps 89:26; Ps 95:1.) Here the word seems to imply that the Lord is solid, unchangeable, completely dependable & unmoving when we need Him to be utterly steadfast on our behalf. Similarly the word “Rock” is used in the New Testament (Mat 16:18; Rom 9:33; 1Co 10:4.) The “rock” from which the stone is cut signifies the divine origin of Christ. 1 Peter 2:4-8 (ANIV) gives us the Apostle Peter’s Bible references to Jesus as the Rock & to Christians as living stones or rocks also: ‘As you come to him, the living Stone—rejected by men but chosen by God and precious to him— you also, like living stones, are being built into a spiritual house [the Church] to be a holy priesthood, offering spiritual sacrifices acceptable to God through Jesus Christ. Things to notice/look out for, in this series. 1) There is a storm approaching. Gradually the clouds change, as we progress from scene 01 (calm weather, fluffy white clouds) to scene 04 & 05 (deep grey, rain filled storm clouds) back to the calm of the storm passing in scene 06. There is no rain falling in scene 01, but scenes 02-06 all have rain. Scene 04 & 05 also have lightning in the sky. 2) Wind. In scene 01 there is little wind. As the scenes progress, & the storm arrives, the wind increases until it is hurricane force in scene 04 & 05! It dies to a light breeze again in scene 06. 3) The colour of the sky, & the ground changes. In scene 01 there is full sunlight, producing intense colours throughout the scene. As the storm clouds approach they progressively block out the sun & a darker, more menacing colouration covers the landscape, from scene 02-05. The darkest shadows & gloomiest colours are seen in scene 04 & 05. Whilst scene 06 sees a return to brighter colours, as the storm passes. 4) Stream & waterfall. In the first scene there is no stream. In scenes 02 the rain has created a small stream flowing in the left foreground, with a little waterfall. In subsequent scenes the stream swells as the rains fall more heavily, until the whole foreground is a mass of churning water in scene 05! In scene 06 the stream has returned to a gentler flow. 5) The Builders. 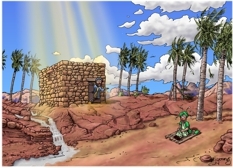 In scene 01, we can see the Wise Builder standing on the red sandstone rocks, wielding a hammer & chisel, to carve out a foundation for his stone house. The Foolish Builder is taking the easier option of simply digging holes in the sand for his house. In scene 02 & then 03, the Foolish Builder finishes his house sooner than the Wise Builder, as he makes his house out of wood, simply by inserting the upright timbers into the holes he has dug in the sand. The Wise Builder takes much longer to complete his house, because he has to cut the foundations out of the solid rock & labouriously stacked the red stones to build his house. Initially it might seem like the Foolish Builder is clever, since he finishes soonest, however, when the storm comes, his house is the one which falls! So quicker isn’t always better!